(The Root) — Though the latest census data confirms that the number of interracial couples in America has grown significantly in recent years, there is still one place in American society where their numbers remain largely invisible: the campaign trail. Despite our country electing a president who is of mixed race, mixed-race couples remain a rarity in American politics. The furor that erupted over coverage of Republican vice-presidential candidate Paul Ryan's admission that he once dated a black woman raises an interesting question, with few easy answers. If society is becoming increasingly multiracial, then why don't those leading society, or running for office to do so, reflect that? Why aren't there more interracial couples in American politics and government? According to political consultant Michael Goldman, who has advised the late Ted Kennedy and current Massachusetts Gov. Deval Patrick, the lack of multiracial families in politics is not that surprising. The reason, he explained, is that having a spouse of a different race still represents a political liability. "To be as ordinary as possible is the goal for a candidate," Goldman said, adding that most voters feel comfortable voting for someone they can relate to. Since most people still marry people of the same race, for many voters a candidate with a spouse of a different race is simply less relatable. He drew comparisons to the struggle faced by candidates who practice a different religion than the majority of their constituents. New York public advocate Bill de Blasio has not allowed such concerns to deter him from a career in politics. He is mounting a campaign to become New York City's mayor. Should the Democrat win, he and his family would make history. De Blasio is white. 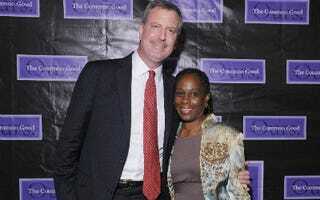 His wife Chirlane is black. De Blasio admitted, however, in an interview with The Root, that the unique challenges multiracial families, including his own, have faced, can be a deterrent to entering politics. "If you're an interracial family you're still dealing with a certain amount of challenge from society around you just in having that family and in trying to make that family work." He explained that the glare of the public eye that politics brings could make coping with those challenges even tougher. Echoing Goldman's sentiments, he said, "Society as a whole is not totally acclimated to interracial families yet." He added, "We can't think of another black-white couple active in politics." They are out there, but to de Blasio's larger point they are few and far between. The highest profile mixed-race couples include former Secretary of Defense William Cohen, who is white, and his wife Janet Langhart, a former Ebony Fashion Fair model and news anchor, who is black. They wrote of the challenges they faced early in their relationship in a memoir titled Love in Black and White. The only black justice currently on the Supreme Court, Clarence Thomas, is married to Tea Party activist Virginia Thomas, who is white. It is worth noting, however, that neither of these couples faced the scrutiny of a campaign. Both men are best known for appointed positions, which means they did not have to defend their unions before voters. In Cohen's case, though, he and his wife married while he was still a Republican member of the U.S. Senate, in the last year of his final term. He has previously acknowledged that the relationship gave some of his supporters pause, meaning their union could have become campaign fodder had he run for re-election. Ryan is not alone. Thirty-seven-year-old Republican mayor-turned-GOP congressional candidate Mia Love, who is speaking at this week's Republican National Convention, is also a member of Generation X and has also dated interracially, and subsequently married. Love is black, while her husband is white. Basil Smikle, a New York-based political consultant who once worked for Hillary Clinton, speculated that couples like Love's and de Blasio's may have an easier time than others, and not just because the public is growing more open-minded. Smikle theorized that black men with white spouses are likely to have the toughest time of all mixed race matches in a campaign. "I think for an African-American male candidate with a white spouse there is a credibility hurdle that he will need to overcome with black voters that another candidate would not face," he said. He explained that while black voters may look at a black woman married to a white man and assume perhaps she simply did not meet the right black man, they see an accomplished black man married to a white woman and assume perhaps he married a trophy wife. This makes visiting black churches and other locales to which black candidates often go a challenge. For instance, as a candidate for the senate in Tennessee, Rep. Harold Ford was the target of an ad featuring a white woman suggestively telling him to "call me," which many viewed as a racially coded reference to his interracial relationships. Ford later explored running for the senate in New York, but by that time his white girlfriend had become his wife. Though New York is not Tennessee, it still would have presented a challenge for him, Smikle explained. "I don't think it is something he could not have overcome," he added. Yet Smikle did conclude that "If Obama had a white wife it is unlikely he would be president." Despite the challenges their unique family may bring in the political sphere, de Blasio and his wife are optimistic about where our country is headed when it comes to race. They recalled that they met weeks after the racially charged Crown Heights riots in New York, and it was love at first sight. Yet after the Spike Lee film Jungle Fever was released that year they were harassed by a group of teens that cornered them while shouting, "jungle fever." Now, two decades later they are preparing to possibly become New York's first family. "Today we feel broadly respected and embraced with a few exceptions," he said. His wife pointed out, though, that there are still times when people see their family together and treat them like they couldn't possibly be a family, what both of them referred to as "awkwardness." "The day I look forward to is when we are a country without awkwardness, where people just accept people in every configuration," de Blasio said. "You would think that by having a biracial president that would be the end of the chapter and we could all go home now, but nothing could be further from the truth. We have a long way to go."